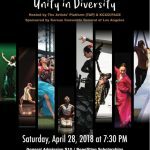 World Culture in Los Angeles! SIGN UP for Free weekly giveaways to Top Shows! 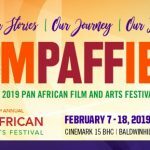 Pan African Film & Arts Festival (PAFF), the largest, most prestigious Black film festival and largest Black History Month event in the US, is one of my most anticipated events of the year! The 24th annual event is February 4-15 at Cinemark/RAVE Cinemas 15 in the Baldwin Hills Crenshaw Plaza and features a staggering lineup of 150 films from around the world on Black life and culture. PAFF co-founder, actor and activist Danny Glover recently criticized the Oscars and Hollywood for its lack of diversity. In a Variety interview, he remembers growing up in the 60s and 70s and being able to see great films from around the world in cinemas. “It would widen my whole sense of myself and my relationship to the rest of the world. That’s what the movies and art is supposed to be about!” Glover says and that’s been PAFF’s mission for over 2 decades: to showcase films from the Black diaspora from around the world that usually don’t get a chance to be watched by wider audiences. The other half of this grand event is the large arts & crafts festival, featuring over 100 artists and vendors, showcasing fine art, crafts and fashion from around the world. So give your eyes a rest between films and head over to find great unique gifts and fashion. Support artisans and small businesses like Amaechina Doreen of ByouBnatural, who will be featuring her handcrafted Art Doll artwork and Wamuhu Waweru of Infinite Miss, featuring crafts and fashion from her travels to her native Kenya, South Africa and most recently Indonesia. There are also special events and programs for everyone, including special screenings for children and seniors, a fashion show, community forums and talks. Don’t miss the special conversation with Nate Parker, whose film Birth of a Nation made recent headlines at its Sundance premiere and got acquired by Fox Searchlight. So without further ado, here are my film recommendations (and yes I really do make an effort to see 20-30 films every year here! )…let the film marathon begin! Hope to see you there and let us know what you think of this year’s films and festival, using #PAFFNow on Twitter and Instagram! Narrative films including the opening and closing films of PAFF. I’m really impressed with the films from South Africa this year! Miles Ahead: The PAFF closing film is about legendary Miles Davis, portrayed, written and directed by Don Cheadle. Kalushi: The Story of Solomon Mahlangu (LA premiere): (UPDATE: This will no longer be shown at PAFF) Based on the true life story of an icon of South Africa’s liberation who joined the military wing of the ANC after the Soweto Uprising, to fight against the brutal oppression of the Apartheid regime. The Two of Us (Thina Sobabili) (US premiere): A fiercely independent and unflinching film by maverick filmmaker Emest Nkosi, about township life in South Africa, touching on issues of child abuse to poor women dating much older men. The film was totally self-financed by a group he founded to help independent filmmakers. Necktie Youth: Beautifully and starkly shot in black and white, this revealing exploration of the generation born after the fall of Apartheid presents a side of South Africa not often seen. Out Of My Hand (World premiere): The story of Cisco, a struggling rubber plantation worker from Liberia, who emigrates to New York City in pursuit of a better life but cannot escape his past. While You Weren’t Looking (World premiere): The complex political and racial climate of South Africa is beautifully encapsulated in this richly complex drama depicting the tension between liberal bourgeois ideals and working-class realities. Affluent mixed-race lesbian couple Dez and Terri struggle to maintain their own desires and ambitions while reining in the rebellious instincts of their beautiful teenage daughter. Stories Of Our Lives (World premiere): A series of five vignettes based on true stories collected from Kenya’s LGBTQ community. One person from the production team was arrested in the making of this film, which highlights not only the great risk LGBTQ individuals face but also anyone who dares to shed light on their plight. The Violin Teacher (Tudo Que Aprendemos Juntos) (LA premiere): Based on a true story of a talented violinist, who is forced to give music classes to teenagers in a public school in Heliopolis, the biggest favela of Brazil. Films about important figures and events in Black history. 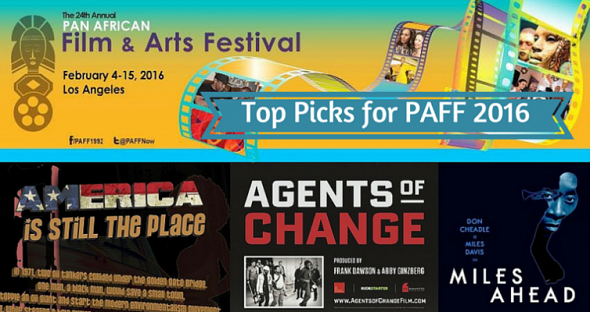 Agents of Change (World premiere): PAFF’s centerpiece film is a documentary about Black student demonstrations across campuses nationwide during the late 60s in response to persistent systemic racism in a desegregated America. America’s Blues (LA premiere): Blues music has transcended generations and racial barriers. It has laid the foundation for pop culture and American music. Blues is a time-honored art, influencing musical genres like jazz, country and rock n’ roll as well as helping to tear down walls of segregation and create social acceptance of cultural diversity. 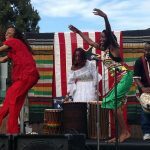 Out of Darkness (US premiere): An epic exploration of the untold history of African people and culture and its impact on world history, and today’s contributions like hip hop which has been co-opted. With Taj Tarik Bey, Sabir Bey, Tim Wise, Professor James Small, Dr. Kaba Kamene, Dr. Joy Degruy. Queen Nanny: Legendary Maroon Chieftainess (West Coast premiere): A mysterious figure, Nanny of the Maroons is Jamaica’s sole female national hero and one of the most celebrated, but least recognized, heroines in the resistance history of the 18th Century New World. This is the story of the struggle for freedom by the Jamaican Maroons, led by the indomitable eighteenth-century military genius Nanny of the Maroons. Ota Benga: Human At The Zoo (West Coast premiere): In 1904, Congolese pygmy Ota Benga was removed from Central Africa and brought to St. Louis for exhibition at the World’s Fair as evidence of an inferior species. At the end of the fair, Ota Benga was sent to New York City’s Bronx Zoo, where he was housed with primates and displayed with monkeys as the “missing link” between humans and apes. In the eyes of his captors, he served as living proof of Darwin’s theory of evolution. A revealing and disturbing film that raises issues still relevant to 2016. BaddDDD Sonia Sanchez (World premiere): The prodigious Sanchez has been on the front lines of art and activism for 60 years—teaching, writing, performing, protesting. She was a pioneer of the Black Arts Movement, fought to establish the first university Black Studies program in the country, and has exerted a widely acknowledged influence on the hip-hop and spoken word movements. Documentary films about social issues affecting Black communities. A Ferguson Story (LA premiere): A montage of the sights and sounds of the protests in and around the police killing of Mike Brown in Ferguson, Missouri. Wilhemina’s War (West Coast premiere): HIV/AIDS is still rising in Black rural communities and the lack of resources and treatment amounts to medical apartheid. I saw this film recently at the 35th Annual Black Doll Show and I urge you to see it, as well as hear Wilhemina Dixon’s testimony in person as she makes her first trip West to be part of these screenings. A New Color: The Very Public Art Of Edythe Boone (LA premiere): Long before ‘black lives matter’ became a rallying cry, Edythe Boone embodied that truth as an African American artist, educator, and great-grandmother. Having challenged inequality through art for decades, Edythe is tested when her nephew Eric Garner dies in police custody everything she has worked for so tirelessly is at stake. The Cooler Bandits: The film documents four men in their respective stages of incarceration as they fight to maintain relationships with family and friends, and reintegrate into society after spending their adult lives incarcerated. Miners Shot Down (LA premiere): A documentary about the shootings of miners protesting for better wages who were shot & killed by South African police in 2012, a damning reflection of a 20 year democracy after apartheid where deep poverty still remains. The Man Who Mends Women – The Wrath Of Hippocrates (L’homme Qui Répare Les Femmes – La Colère D’Hippocrate) (US Premiere): A film about Doctor Mukwege who is internationally known as the man who mends thousands of women who have been raped during the 20 years of conflicts in eastern Democratic Republic of the Congo, where the film has been banned. You should also check out Dry, a film from Nigeria raising awareness on the plight of women who suffer from fistulas. This year features many short films and documentaries about the complexity of the Black experience from colorism to mixed race experience. Across The Tracks: Two sisters grow up in 1960s Georgia. But one is born with light skin and when schools integrate, she decides to change her destiny – by passing for white. By Blood (LA premiere): Though they were perpetually oppressed throughout America’s history, some Native American tribes were themselves guilty of oppression: they owned African slaves, a piece of American History that is often overlooked. Nearly 140 years after formalizing the tribal citizenship of its former slaves, the Cherokee Nation began removing their African-American citizens, or Freedmen. Invisible Roots: Afro-Mexicans In Southern California (LA premiere): Mexico is home to many African-descended peoples who have now immigrated to Southern California. Through intimate portraits, members of three Afro-Mexican families discuss what it means to be Mexican with African roots, roots that are often forgotten, denied and frequently despised. Born With It: On his first day of school in a small Japanese town, a half Japanese, half Black boy tries to prove to his new classmates that his dark skin is not a disease. King Of Guangzhou: A Nigerian man wants to stay in China with his pregnant wife, but his visa extension has been denied. Facing imminent deportation, he is forced to go to a friend to secure an illegal visa from the underground market. He must now decide to risk all he has worked for or be separated from everything he loves. Documentaries about the rich history and pioneering figures of the Black community in LA. Bridging The Divide: Tom Bradley And The Politics Of Race: Thirty-five years before Barack Obama’s election as president, the question of race and the possibility of bridging racial barriers were put to the test in an overlooked story in American politics: Tom Bradley’s 1973 election as mayor of Los Angeles–the first African American mayor of a major U.S. city elected with an overwhelmingly white majority. Spirits Of Rebellion: Black Film From UCLA (West Coast premiere): This film documents the lives and work of a small group of critically acclaimed, but as of yet relatively unknown, group of black filmmakers and media artists known as the Los Angeles Rebellion, the first sustained movement in the United States by a collective of minority filmmakers. One of those filmmakers, Billy Woodberry, will also screen his long awaited new film And When I Die I Won’t Stay Dead, about beat poet Bob Kaufman. Can You Dig This: There’s a revolution taking place in South Central Los Angeles, one of the largest food deserts in the country. An urban gardening revolution! We follow the inspirational personal journeys of five ‘gangster gardeners,’ all planting the seeds for a better life. 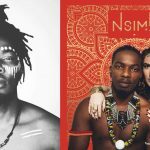 This entry was posted in Film and tagged birth of a nation, black cinema, black film, black history month, danny glover, diversity, hollywood, los angeles, nate parker, oscars, paff, paffnow, recommendations, top picks by Tom. Bookmark the permalink. Copyright © 2019 EnClave.LA All Rights Reserved.